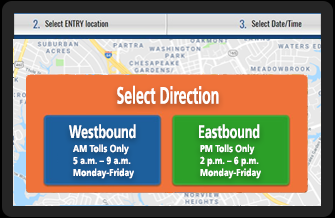 Find current toll prices for the 64 Express Lanes and historical pricing information. Also available for your phone in the Apple and Google app stores. If you are a solo driver, you can use the lanes during operating hours by using E-ZPass to pay a variable toll. If you have two or more people in your vehicle, you can continue to use the lanes free, but yoi must have a funded, properly mounted E-ZPass Flex transponder switched to "HOV ON". Operating hours will be 5 a.m.-9 a.m. westbound and 2 p.m.-6 p.m. eastbound Monday through Friday. Outside of operating hours, the 64 Express Lanes will remain free and open to all drivers with no E-ZPass or HOV requirements. Through dynamic tolling that keeps traffic free-flowing, you can have a quicker and more predictable trip on the 64 Express Lanes. If you travel on the 64 Express Lanes when tolling is in effect Monday through Friday, 5 a.m. - 9 a.m. westbound and 2 p.m. - 6 p.m. eastbound, you must have a funded and properly mounted E-ZPass in your vehicle. If you are traveling with two or more people in your vehicle, you will need an E-ZPass Flex switched to "HOV ON" in order to travel free. Visit www.ezpassva.com to get your E-ZPass or E-ZPass Flex.